2130: Zut alors! It's nine-thirty and we're just wrapping up the live. Cheese was right to get an early exit and head off for some snooze because she will be back for, um, Super Saturday where a chap called Andy Murray is back in action on Centre Court. Tuna baguettes, coconut ring biscuits and a pinch of patriotism at the ready please. Adieu. 2128: "What a match on Centre! I think Ancic had the advantage with that big serve in the tie-break when it was getting darker!" 2126: Safin saves two break points at 5-4 in the fourth. He then sets up his first match point but nets to see it sail past. The Russian shakes his fist as he claims another match point and this time Seppi nets to see Safin move into the fourth round. There's just the tiniest smile on Safin's face. "If there is such a thing as destiny it's sport. I wonder if Marat Safin is meant to be deep in the second week. We thought he was the force back in 2000, and now he actually looks like he's enjoying himself." 2120: One more time on my watch comes the Brit up arrow. Anne Keothavong and Ross Hutchins have fought back from a set down to see off Perry and Santangelo, taking the third set 6-4. They're into the second round. And while we're talking of mixed doubles, we expect the lovely Jamie Murray to start his campaign on Saturday. 2118: Over on Court One, Safin is serving for the match. Andrew Castle says: "Safin won't take the light now, he's more than happy to play. It's turning into a party here." Steady on Andrew. 2116: That's it. It's quarter past nine, and Mario Ancic is into the fourth round as he takes the breaker 7-3 and the match in four sets. I feel a mite sorry for David Ferrer, but not sure why. 2112: Slam! Ferrer flings his racquet down as he hands Super Mario his first set point. The Croatian nets to save it. Nail-biting - and I'd say it's properly dark now. 2106: Centre Court has livened up no end. People are actually on their feet, raising their arms and cheering. We think it's because anyone can just wander onto Centre now, and they are loving the tight battle between Ancic and Ferrer. And that's heading for a tie-break now. "Let's get it finished," demands my esteemed colleague. 2101: Safin must still be seeing clearly because he's just broken Seppi for a 3-1 lead in the fourth. Centre Court erupts as... Ancic falls over and Ferrer holds. Is everyone losing the plot now? 2058: "It's very gloomy outside. I didn't see a ball - but you could." 2053: What's my favourite graphic? Say, what's my favourite graf-eek? It's the Brit up arrow and here it comes. Hutchins and Keothavong have only gone and levelled their doubles match and are a break to the good in the third. (Apologies, I may also be delirious now). 2052: Ping! Dave Ferrer bounces his racquet to the floor as Ancic saves three break points in the third set. The incident is soon forgotten though as he conjures yet another break point - but that one goes begging too. Ancic holds, and it's 4-3 and on serve in the fourth on Centre. Not sure how the players can see out there as my eyes are straining a little bit now - and we've got the lights on in here. 2046: There's a third set tie-break happening over on Court One. Safin gets the mini-break at 2-0 as Seppi nets and the Russian races into a 4-0 lead. Seppi gets three points back but Safin challenges a calls, gets the decision and three set points. He wraps up the set, taking the breaker 7-3, to take a two-sets-to-one lead. Safin might be happy but look what he's done to Seppi's fitness trainer's daughter. She's in tears in the box. The umpire puts a call in to the referees' office to ask about light, but he slams down the blower and play continues. "I'm very surprised at this," says sensible Davis Cup captain John Lloyd. "It looks like the players don't want it. If I was a player, I'd be saying this is ridiculous." 2025: Turns out our plucky Brits Anne Keothavong and Ross Hutchins play better in the dark. Having dropped the first set to Todd Perry and Mara Santangelo, they're now 3-0 up in the second. 2023: Crikey, I can barely see what's going on out of my window - but it's a tinted window so... Andrew Castle predicts there will be 30-40 minutes more play this evening. Very precise, I like that. 2018: Marat Safin is a man on the edge, as is my BBC Sport colleague as a brief powercut causes havoc with the computers. Safin wants to refer a call to Hawk-Eye - but he's all out of challenges. "Yeah, yeah, yeah, yeah," says the Russian as the umpire alerts him to his error. The crowd chuckle. Safin is not amused. At all. 2004: The Centre Court crowd are loving this. Dave Ferrer looks down and out when he squanders a 4-1 lead in the tiebreak but the gritty Spaniard holds his nerve and takes it 7-5. He's off for a 'comfort break'. 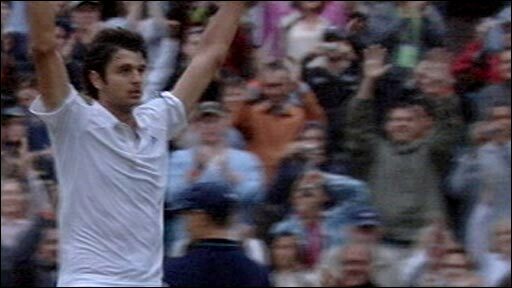 Mario Ancic leading two sets to one now and it looks like they'll carry on despite the gathering gloom. 1959: Classic Safin match this. He went on a total walkabout at the start of that second set, then clawed his way back from 5-1 to 5-3 before the mistakes returned. One set all. "It's awesome tennis," says John Lloyd. It is indeed. The balls are taking one hell of a battering. They'll play one more set, reckons Andrew Castle. 1953: It's looking a bit gloomy out there. Not sure we'll get much more play today - and if Seppi takes this set against Safin (he's 5-3 up), I think they might call it a day. I'm only guessing mind. 1948: Is it wrong that I want Serena to win the title purely on the basis that I like her new hairstyle? I suspect it is. Well, her press conferences are also at least as entertaining as her matches. Here she is on her ideal man: "Gosh, I would say someone who's close to their Mom and someone's who's nice and that you can dance with and laugh with." 1944: I don't have a Stars and Stripes graphic but if I did, it would be pointing down right now. Bobby 'Burt' Reynolds is beaten by F-Lo and that's American interest in the men's singles ended before the third round has even finished. Lopez faces Baggy next in what should be a cracking match I would think. 1933: Baggy is through, a straight-sets winner over Simon Stadler. But bad news Brits, Elena Baltacha and James Auckland are beaten by Czech pair David Skoch and Iveta Beneseova, 9-7 in the third. Never fear, though, Ross Hutchins and Anne Keothavong are just starting their match against Australian/Italian pair Todd Perry and Mara Santangelo. 1932: Ooh, I thought I was going to be able to bring out the broken racquet graphic just then. Marat Safin shanks a forehand to concede the early break in set two and goes to do some serious damage to his bat - before thinking better of it. 1924: Marat Safin flings a gorgeous backhand winner cross-court to bring up set point in the tiebreak and a huge serve wraps it up. He is happy (although it's hard to tell). I am happy. 1915: "After winning the French Open, I had a very emotional two weeks. With my coaches, we cut down practice so I could recover and spend more time with myself. Next year I'll have to spend more time on court. I didn't have a good preparation for playing on grass." 1912: Super Mario's two sets up on Dave Ferrer and very well he's playing too. Big-hitting Spaniard Fernando Verdasco awaits the winner of that match. The Safin-Seppi ding-dong is tiebreak bound in the first set. Bobby 'Burt' Reynolds has launched a bit of a fightback against Felicano 'F-Lo' Lopez, who now leads by two sets to one. 1905: "So you don't think much of Serena's bag, Caroline? You're calling it lame." 1902: Blimey. Kops-Jones/Spears live to fight another day after coming through an epic against second seeds Ai Sugiyama and Katerina Srebotnik - 11-9 in the third set. I guess that means I have to look up their first names. It's Raquel and Abigail. Well done to them. 1900: Stan Wawrinka, practice partner of Roger Federer and sometime doubles partner of Andy Murray, is through to the fourth round after Mischa Zverev decides enough is enough. Not sure what the problem is but the German retires while trailing 7-5 6-1. Mario Ancic a set and a break to the good against Dave Ferrer, Marcos Baghdatis two sets up on Simon Stadler. 1855: Serena Williams arrives at her post-match press conference wearing her much talked-about white trench/lab coat and carrying a gold lame bag. She is asked what she thinks of her next opponent Bethanie Mattek's wacky outfits. "I really appreciate her courage," says Serena. Not exactly a ringing endorsement, I'd say. 1846: "All the early indications are that Marat Safin is going to have to work very hard if he's going to win this match. Andreas Seppi is getting every ball back." 1843: Here's a thing: I've tipped Marin Cilic to reach the last eight here - but I wish I'd backed Stan Wawrinka as well. The 'other Swiss' is running away with it against German Mischa Zverev and if he comes through, he'll face the winner of the Safin-Seppi match in the last 16. 1835: Some great names out on court at the moment. My colleague Sarah Holt has just alerted me to Martin/King on Court 14 (no sign of Luther) and I'm rather taken with the Kops-Jones/Spears duo on the adjacent court. 1830: I know it's hard to move on, but we must. Because over on Court One, the quite beautiful Marat Safin is in action against Andreas Seppi. Mario Ancic is serving for the first set against fifth seed David Ferrer. Marcos Baghdatis has pocketed the first set against Simon Stadler. And I'm afraid it's time to dust off the old Brit down arrow as Agustin Calleri and Kaia Kanepi polish off Richard Bloomfield and Sarah Borwell in straight sets. Boo. 1823: "First Shazza, now Ana. Why God Why?" 1819: "So Cheese who can us red-blooded males gawp at now? Seriously is there any underlying reason for all these shocks?" Well to answer the first point, my colleague Piers can tell you all about the many qualities of Gisela Dulko. She plays Elena Dementieva tomorrow, another tabloid favourite. On the second point, it's the same old, same old: injuries, hectic schedule, plus, in Ivanovic's case, a lack of experience on grass. 1818: So Sharapova and Ivanovic - the two Australian Open finalists - are gone, much to the chagrin of the Sun newspaper I'm sure. The women's draw is wide open now and you have to say it's looking good for the Williams sisters. 1816: I think Zheng Jie is surprised. She tells BBC Sport: "It's a great surprise for me, but I say thank you to Wimbledon for the wildcard. I tried my best and told myself to keep going and going. I'm very surprised." Sorry for the sudden attack of bold there but it's not often the world number one and top seed goes at at the third-round stage. Very composed performance from Zheng Jie but Ivanovic has a lot of learning to do on grass. 1808: Well, Zheng will have to serve this out. It's now 5-4. There is tennis going on elsewhere, it's just not quite as dramatic as what's going on on Court One. 1806: Goodness me. Is Ana going to leave it until match point to launch her comeback, as she did the other day? She's now 5-3 down and Zheng is just relentless from the baseline. "Ivanovic is being beaten below the knees," says Virginia Wade - to puzzled looks all round from this commentary box. "The balls are coming so low at her." Oh, I get it. 1803: "Surely Ana Ivanovic is too pretty to go out?!" Er. Try telling Shazza that. 1800: Ana holds serve and she's now 4-3. "She needs to remember who she is and why she's at the top of the heap," says Virginia Wade. Indeed. I think I've long forgotten who I am. 1758: Hello again. But enough of the niceities. Back to Ana-watch. She has break-back points but Zheng holds firm and she's 4-2 up. 1748: "Looks like Ana will need to dig deep again." And that bit of news signals the end of my live run. Ian in Eastbourne, hold onto your hat. The wait is over - Cheese is back. 1748: Serena picks up a low ball and sends it chipping past Mauresmo to seal the match 7-6 (7-5) 6-1. She fairly skips back to her chair. The mac - which looks like a lab coat from the back - goes back on, and she goes off. "It was so windy out there, I couldn't make my shots," says Serena. "I'm thinking positive and there is so much more than I can do." 1745: Trouble for French Open champion Ana Ivanovic on Court One. She's a break down against Zheng Jie now. The world number one is thumping the ball in anger now and she gets the break back. 1739: Here's some words from Roger on playing Lleyton next: "I played well against him last time we met. It has been a while now and that may work in his favour. Hewitt is a great player and a great competitor - we were playing against each other when we were 15 so go way back. With him being a former champion here and world number one it will be an intriguing match for both of us." Just to fill in Roger's gaps. He has a 13-7 record over Hewitt, and the last time they met was in Cincinatti in 2007. 1735: Bad news fellas. Top seed Ivanovic crumbles against Zheng, losing the first set 6-1. Bevo returns to say she is playing "shocking" tennis. 1729: Amelie Mauresmo calls for the trainer as Serena sails to a 3-0 lead in the second set. The French 29th seed gets some work done on her injured thigh. Serena consults her notebook - said to contain positive affirmations - under her towel. Then she stands up and goes through the motions, serving, swiping at the ball. To be fair, I didn't look that dissimilar when I was playing the Wii round my mates' house - until I hit my elbow against the wall. 1724: News just in from our intrepid reporter/tea-boy Bevo, who's back bothering people on Court One. "Jie Zheng, who beat Brit Elena Baltacha in round two, is on fire here. Ana Ivanovic is in trouble early doors and has just been broken, with Zheng leading 5-1"
1718: As if enough top men's seeds hadn't already scurried out of Wimbledon, number 11 seed Tomas Berdych has just waved goodbye, as Fernando "Don't Call Me Tabasco" Verdasco proved too hot for him on Court Two. The Spaniard walloped him 6-4 6-4 6-0. 1713: A rather tourtous first set from Serena Williams and Amelie Mauresmo on Centre. The pair swapped breaks but the set had to be settled by a tie-break which Serena, grunting for all her worth, took 7-5. Unseeded Bethanie Mattek has toppled 11th seed - and last year's finalist - Marion Bartoli in straight sets over on Court 11. Poland's Agnieszka Radwanska has also ended the run of Russian qualifier Anastasia Pavlyuchenkov and will face Kuznetsova - who turned 24 today - next. 1705: I have been a bit remiss in not providing answers to some of the questions posed earlier. Regarding John McEnroe's turkey sandwich demands (1357), this reply has come in from BBC Sport's Stoat: "I'm working in the production office not the canteen! Sorry, we don't know." Sounds like The Stoat was too chicken to ask Mac about his turkey. Hmmm. As to the Rev's request on which female players to follow on Saturday, the Gisela Dulko fan club has been gathering momentum, and she plays Shahar Peer. All sensible female eyes will be on Rafael "Muscles" Nadal. "I think there were two sides to that match. Hewitt was fantastic, played solidly and won 93% of his points on the first serves. On the whole it was disappointing from Bolelli as the first two sets were over in a flash and from then on he was up against it." 1637: Bad news for Davis Cup specialist Ross Hutchins. He and partner Stephen Huss are out of the men's doubles thanks to Israel's doubles specialists Erlich and Ram. Let the arrow of doom show itself. 1634: The court-covering teenagers have slunk back into the recesses of Centre Court. "It's just like a cuckoo clock," says Caroline Cheese, waiting for Bevo's teas. 1631: On Court One, Bolelli fends off Hewitt's first match point with an ace. The pair of them are locked at 5-5 in the third. Bolelli has suddenly found his game, but is it too late? 1625: Around the courts we go. Saucy Verdasco has taken the first set from Tommy Berdych on Court Two. Alla Kudryavtseva chalks up another victory at Wimbledon after ousting Maria Sharapova on Thursday, as she and Vania King win their doubles match. The court-covering youths are gathering on Centre though as things begin to look a little gloomy outside the window. 1622: A flurry of activity here on Centre Court - least of all Serena Williams appearing in her thigh-length mac as she takes on another former champion Amelie Mauresmo. Serena might have looked silly earlier in the week but I bet she was feeling pretty smug during those downpours earlier today. Anyway, to follow Serena's fashion sense and more, my colleague Dirs has all the grisly details. Live - Williams v Mauresmo. 1617: Bad news for Aussie Stephen Huss and Britain's own Ross Hutchins in round two of the men's doubles. They are 4-2 down to Jonathan Erlich and Andy Ram in the fifth set. The Brit down arrow is looming. 1614: "Chris Eaton's exploits this week already seem a long time ago but I haven't forgotten him yet. I'm stood on the roof watching top men's doubles seeds Bob and Mike Bryan, who knocked out Eaton and Slabinsky in round one, play Tursunov and Kunitsyn. Tursunov dumped poor Eats out last night but that is not doing him much good now, the Bryan bros have just taken the first set." 1602: Roger Federer finds time for a spot of keepy-uppy as he races relentlessly to victory. Then the five-time defending champion plops down a serve, Gicquel goes wide and that's that. Federer wraps up victory in just one hour and 21 minutes. He goes to the centre of the court, takes the plaudits from the crowd and he can look forward to a long weekend with girlfriend Mirka, as he's not back on again until Monday. John McEnroe says: "Gicquel was overwhelmed there to put it mildly." Roger says: "I think I played really well in difficult circumstances. I'm looking forward to a nice weekend now." 1554: "Bolelli, well, he's got better against Hewitt but he's still doing badly. By the looks of things, Hewitt will be playing Fed next. I've just got a feeling that one might not be so easy." 1545: Quick check around the courts. On Centre, a bloke called Roger is rattling his way through his match against Frenchman Gicquel - he's two sets up now. Hewitt is going great guns on Court One, the 2002 champion, also has a two-set advantage over Bolelli, vanquisher of Bogdanovich in round one. On Court Two, Fernando Verdasco - not to be confused with the sauce - is a break up against Tommy Berdych. And last year's finalist, Marion Bartoli is just beginning her match against Bethanie Mattek on Court 11. 1541: "The most competitive and/or exciting thing about this match was a quickfire exchange of 'c'mon Bolelli' and 'c'mon Hewitt' by two fans in between points. The Hewitt fan won 3-2 - and his man is a break up in the second set too." 1535: Time to hoist the Brit up arrow. Bald, but bearded, Jamie Delgado and partner Katie O'Brien are through the first round of the mixed doubles after a decent win over Rogier Wassen and Virginie Razzano. O'Brien serves up the win, the Brit duo smile and kiss - on the cheek, nothing saucy - and the crowd on Court 3 are more than happy to applaud them off the court. 1528: "Cheese beetroot and salad cream sandwich takes some beating. Who is top eye candy to see on middle sat now that shazza has downed tools." The reverend green via text (Praise be, Reverend. I'm a big fan of said sandwich, how did you know? I'll consult my colleagues for the answer to your question). 1522: Anna Chakevetadze is through to the fourth round, where the eighth seed meets today's other ladies winner, Vaidisova. Kuznetsova (she's not the same without the 2007 corn-row hair though is she?) also marches through. 1509: "This is only Bolelli's eighth match on grass and his lack of experience is showing. First set to Hewitt in just 27 minutes." And Bolelli has just been thumped 6-1 in the first set by Lleyton Hewitt. On Centre, Federer races through the opener 6-3 against Gicquel. 1458: And we have our first winner of the day. Hurrah. Nicole Vaidisova, who I seem to recall was the first player to win a match in the whole tournament, has seen off Aussie Casey Dellacqua in straight sets. One of Rodina and Chakvetadze up next. 1449: "This one could be over very quickly. Bolelli is having a shocker and can't keep the ball in. He has won only one point in the first three games." 1444: Looks like Svetlana Kuznetsova isn't wasting any time wrapping up victory over Barbora Zahlavova-Strycova over on Court Two. The Russian is 6-2 3-0 up and, with apologies to her family, friends and fans, I'll be pleased to see the back of Mrs Z-S. Takes me hours to type. 1435: "Distinct lack of celebrities around SW19 today… but I did just encounter the legend that is Richard Williams on my way to lunch. Venus and Serena's pa made made a very big show of stepping aside to let me through as I hurried to the baguette queue. A true gentleman." 1432: OK, we're officially in business. Roger Federer and Marc Gicquel come through the white door from the locker rooms and onto Centre Court. Roger is wearing the cableknit cardigan again and looking lovely I have to say. Lleyton Hewitt shuffles out for his match against Simone Bolelli on Court One, and the outside courts are poised for action too. You can follow all the action from Le Fed's match thanks to my surly colleague Dirs. Live - Federer v Gicquel. 1426: More news from The Voice. Play will start on Centre Court and Court One at half past two while the other courts will get going shortly afterwards. So let's celebrate with a little ray of sunshine. 1419: "Can someone get Neil Diamond in? He claimed he always has California sunshine with him." 1415: There have been a few questions about the much-hyped Centre Court roof. The roof will be ready for next year's championships. It'll be translucent so natural light will be able to reach the grass. According to official bods, the roof, " has been designed to close/open in under 10 minutes and will be closed primarily to protect play from inclement (and, if necessary, extremely hot) weather". 1410: Well, I don't know what's going on at Wimbledon now. The youths are back on taking the covers off Centre Court and it looks like tentative steps to do likewise are being taken on the outside courts. BUT those heavy showers that The Voice predicted have failed to materialise. Surely The Voice can't be wrong? If he's wrong, then who's right? 1405: "Fed's fave sarnie is obviously swiss cheese served on a bagel." 1357: "I used to work at Wimbledon. Could you tell me if Johnny Mac still has to have a turkey sandwich made for him every day?" 1346: The Voice of Wimbledon returns with his forecasts of the skies, he says: "The band of rain has just about cleared but we do expect another heavier band of rain in about 20 minutes. After that we will be more optimistic." So looks like we are sitting tight for now. 1341:"Nothing beats a good sandwich with quality ingredients. Me - I am a Black Forrest ham person (sliced thinly), add a few sun-dried tomatoes and a few sugarsnaps, can't get enough!" 1335: "I work for the local weather station and can confirm looking at the radar, this is a temporary blip which should fizzle out within 15 minutes." 1331: "Michael Stich has just told me the rain will be back. Nice chap, though. He has got 'MS' embroidered on his cuffs and "Former Champion" on his pass, just to aid identification." 1325: That sunshine graphic was a bit premature. The covers are back on. There is a growing feeling here that Dirs might be responsible for this. Day one at Wimbledon for him and looks what happens. Lots of brollies going up on Centre Court now and Sue Barker says; "Just as soon as the players were coming out of the locker rooms, the rain came. But the staff did get the covers on very quickly." 1320: The soothing voice of Wimbledon has this to say on the weather: "Play will start on Centre and Court One in 10 minutes and on the outside courts as soon as the umpires have inspected the courts. There is still a slight threat of rain but we live in hope to avoid that." Because The Voice is so lovely, we'll have the sunshine graphic to celebrate. 1314: "Safin will either destroy his opponent Seppi, or he will destroy himself. That's why he is such entertainment. You never know which Safin is going to turn up." The Safin match should be a good one, Monty. The moody Marat is third on Court One against Andreas Seppi and we'll be keeping a close eye on that one later. 1309: The covers are rolled back again from Centre - and the girls and boys in green do likewise on the outside courts. I'm undecided over whether it's going to be one of those days or whether this is just a minor blip. 1305: "Murray is sheltering up at the practice courts. He looks pretty relaxed though. Caroline Wozniacki was engaged in some skipping on the court a minute ago, so all eyes were on her." 1259: Boo. Covers are on all the courts now. Apparently, showers were expected between now and 3pm and the skies over Wimbledon are looking ominously grey. 1257: "Hey where's Miss Cheese? It said she was here today, i was looking forward to her wit! Not amused!" 1252: Oh no, the covers are back on Centre. Still playing elsewhere though. Ben Dirs is fuming. 1247: As it turns out it was a measly little shower designed to test the sporty students who are employed to peel over the covers as though their lives depended on it. The covers are off now. Vaidisova, the 18th seed here, has rattled through the first set 6-2 in spite of the rain-drops while Kuznetsova is poised to take the first set. Bad news for Delgado and O'Brien - the Brits have only gone and lost the first in the doubles. Who'd thunk it? On Court Nine, a player called Travis Parrott is in action in the men's doubles. I like the sound of him. 1234: Uh-oh, I don't like to say anything but the covers have just been pulled over Centre Court. Two of my colleagues can confirm that indeed it is raining. Cheesey reports umbrellas around Centre while Bevo reports rain up at the practice courts, though Andy Murray is still heading up there by all accounts - well at least Bevo's account. There is still some play on the outside courts. 1228: Well, play has started so let's take a quick gander round the courts. Nicole Vaidisova has broken Casey Dellacqua out on Court 18 and is 4-2 up in the opener while Svetlana Kuznetsova and Barbora Zahlavova are on serve on Court Two. Other than that, there's a feast of doubles action including balding Brit Jamie Delgado and Katie O'Brien in their mixed doubles match against Rogier Wassen and Virginie Razzano. 1221: "Brit Alex Bogdanovic is still hanging round the practice courts. He's knocking up with Marcos Baghdatis now. Baggy wants Boggo to work on his backhand apparently. They are enjoying themselves too." "Blake's never done well here and he doesn't seem to be believe he can do well here. Other than a few big Davis Cup wins, it seems like for the most part he comes out and plays one way. The disappointing thing about Roddick was that he really tightened up and when he plays tight the power he has off his forehand just gets so unsteady. So, like he said, he choked." There is one American left in the draw though; Bobby Reynolds takes on 31st seed Feliciano Lopez later on. Not sure Mac rates his chances though, he says of Bobby, "he's a real competitor". 1205: "There's thick grey cloud and a touch of light rain in Waltham Cross. I do hope it's not SW19 bound." Indeed John. It is pretty nippy around the courts right now. 1200: Oh no, Caroline's shivers have got so bad that she's gone off for a group huddle with BBC Sport's Chris Bevan to try and get warm. And if any man is the man for that particular job, it's Bevo. That leaves me to take you through the live action for a little while. Players are due on all courts but Centre and Court One right now. Yay. 1144: "Did Huss and Hutchins finish their doubles game yesterday? Is it the Brits up arrow or the down one?" Huss 'n' Hutch return today to finish their match against third seeds Erlich and Ram. The Aussie-Brit combo lead 7-6 (7-3) 4-6 6-3 2-4, so fingers crossed. 1135: Rare excitement in Commentary Box Three as the Royal Box guest-list arrives. A Mr Peter Jackson, which may or may not be the Lord of the Rings director, and former semi-finalist Slobodan Zivojinovic are the highlights - along with the fabulously named The Rt Hon The Baroness Brenda McDowall, Dean of Thornton-le-Fylde. Still. No. Stilgoe. 1125: "Re 1115: Tipsarevic is a great player, destined for the top 10 at least. He has all the shots, just needs consistency. Oh. And he's gorgeous too..."
1115: "I am feeling rather depressed after Roddick went out, he just couldn't play the big points well enough and he will missed this year." 1101: Vince Spadea is gone, but not forgotten. His freestyle Wimbledon rap manages to rhyme Spadea, radio-a and Pennsylvania. The man is a lyrical genius. 1050: "Re 1029: I believe it is incorrect to say "the" hoi polloi, not to mention a tad cheeky..."
1042: Someone at Radio Wimbledon is a huge fan of Black Eyed Peas, as is British number one Andy Murray by the way. But I think I've heard more from the Peas than I can take. The manicured lawns of SW19 are currently being rocked by the unlikely sound of "My Humps". 1035: "Regular users will attest that it's the District Line that isn't to be believed..."
1029: The gates will be open to the hoi-pol... sorry, I mean general public in a minute or two when we'll witness the usual unseemly dash for seats on the outside courts. Court 18 might be a popular destination where Nicole Vaidisova is up against Aussie Casey Dellacqua. 1004: "Re 0942: Aha! Does that mean Piers is the Mole?" 1000: The second match on Centre Court today sees two former champions collide... not literally. Serena Williams leads the head-to-heads with Amelie Mauresmo 9-2, but the Frenchwoman won their last meeting in 2006. Serena, as always, is "excited" and says Mauresmo's slicey-dicey game won't be a problem for her. "Oh, no. I've developed a slice myself. I'm really excited about it." Excited is Serena's favourite word if you hadn't already guessed. 0950: "The pick of the matches today is Ancic against Ferrer it should be a cracker." 0942: "Re 0922: Caroline, surely assistants Piers or Sarah will be winging their way with warm beverages as you type?" 0934: BBC weatherwoman Carol Kirkwood - who I can confirm is as nice as she appears on the telly - is taking over SW19. She's turned up on Radio Wimbledon now, revealing that she thinks John Lloyd is "lovely, charming and very good-looking." Well, well. 0930: "With Roddick and Sharapova out I'm gutted! So all my attention is gonna be firmly shifted to the lovely Rafa and Andy Murray of course. Haven't quite decided on my allegiance for the women's title yet. I'm thinking Serbia... and straying towards Jelena!" 0922: Lordy, I don't know what happened to the air conditioning in this commentary box while I was off yesterday but it's arctic in here. I hope back-up arrives soon with hot chocolate and blankets. Still, I'll no doubt be warmed by the sight of plenty of Brits in action today. Anne Keothavong is back on court with mixed doubles partner Ross Hutchins, while elsewhere there's Delgado and O'Brien, Bloomfield and Borwell, Auckland and Baltacha. Hurrah. 0915: Of course, the Sun has got its unique take on Sharapova's miserable performance. "I reckon the shorts might be to blame," 24-year-old fan Joe Swain told the newspaper. And of course, Alla Kudryavtseva claims the controversial tuxedo-inspired get-up was a factor in her victory. "Well I don't like her outfit," joked the Russian. "That was one of my motivations." 0907: One of the many things I love about American coaching guru Nick Bollettieri is the way he pronounces "Wimble-ton". Magic. Anyway, Maria Sharapova is one of The Don's many former pupils. So what would he have said to Shazza after her shock defeat yesterday? "Nothing," he tells Radio Wimbledon. "Let her alone baby, just let her alone." 0901: Obviously, the big match today is third on Court One, between the delectable Marat Safin and Italian Andreas Seppi, but as I tear my eyes way from that one, I suppose there are highlights elsewhere. Serena v Mauresmo, Ancic v Ferrer and some horribly long names - not least Barbora Zahlavova-Strycova who's up against Svetlana Kuznetsova on Court Two. 0851: All this glorious sunshine is almost making me feel wistful about those days of heavy rain and thunderstorms last year. Almost. BBC weatherwoman Carol Kirkwood says there's a slight chance of a shower today, but she doesn't seem all that worried - so neither am I. 0845: Morning all, recovered from last night's late sporting action? Excellent. There is talk of rain around the All England Club today but we simply refuse to believe it and will press on. Today you have the delights of, among others, Roger Federer, Ana Ivanvovic, Marat Safin and Serena Williams on offer. And Anastasia Pavlyuchenkova. - We'll be here throughout the day to bring you the latest news from around the All England Club, both on the courts and off, so whether you're settling down at home, stuck in the office or queuing on Church Road, send us your thoughts.